“Branden, from Cowdell Insurance, has saved us a lot of money! Both cars are insured for a great deal. They have the best customer service I have ever received. Thank you!” —Jenny A. If it is necessary to change lanes, signal your intentions to drivers behind. Change lanes smoothly and carefully. Steer as your vehicle slows down. It is better to roll the car off the roadway (when slowed to 30 miles per hour) and into a safe place than it is to stop in traffic and risk a rear-end or side collision from other vehicles. Have the car well off the roadway and away from traffic before stopping, even if that means rolling along slowly with the bad tire flapping. You can drive on a flat if you take it easy and avoid sudden moves. Don't worry about damaging the tire. It's probably ruined anyway. Once off the road, put out flares, warning flags or reflector triangles behind your vehicle to alert other drivers. Keep your emergency flashers on. Raise your hood and tie something white to the radio antenna or hang it out a window so police officers or tow truck operators will know that you need help. Don't stand behind or next to your vehicle. If possible, stand away from the vehicle and wait for help to arrive. If you know how to change a tire, have the equipment and can do it safely without being near traffic, change the tire as you normally would. All interstate highways and major roads are patrolled regularly and some have special "call-for-help" phones. If you have a cell phone you can call right from the roadside. It is inadvisable to walk on a multi-lane highway. However, if you can see a source of help and are able to reach it on foot, try the direct approach by walking but keeping as far from traffic as possible. The National Safety Council recommends that you have a qualified mechanic check your vehicle after having a flat tire to be sure there is no residual damage from the bad tire or the aftermath of the flat. 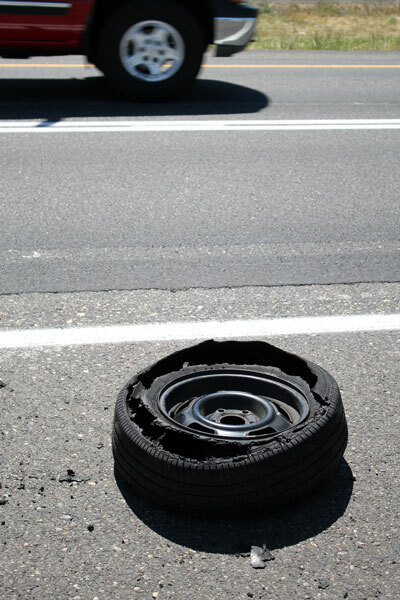 If you feel the tire may have been defective, save it for testing and analysis.